Today we are bidding adieu to Beaune and heading to Annecy in the Rhônes Alps region. Beaune is one of the most beautiful places I’ve ever been and I look forward to visiting again! I’m not too familiar with Annecy and honestly, in my own ignorance, I thought we were heading to Lyon, but it’s definitely not Lyon. Breakfast was kept to croissants and coffee this morning as we said goodbye to Bruno and headed to the train station. When we made it to Lyon station we grabbed a quick bite, Croque Monsieur, and hopped another train to Annecy. After a two hour train ride through the gorgeous mountains we finally arrived. Tourist Mistake #1 – not looking at a map before you take a cab to your hotel. One block and 10 Euros later we arrived at our hotel asking ourselves…what just happened. So now we know to look on a map and find your hotel first so you’re not gauged by the taxi driver. 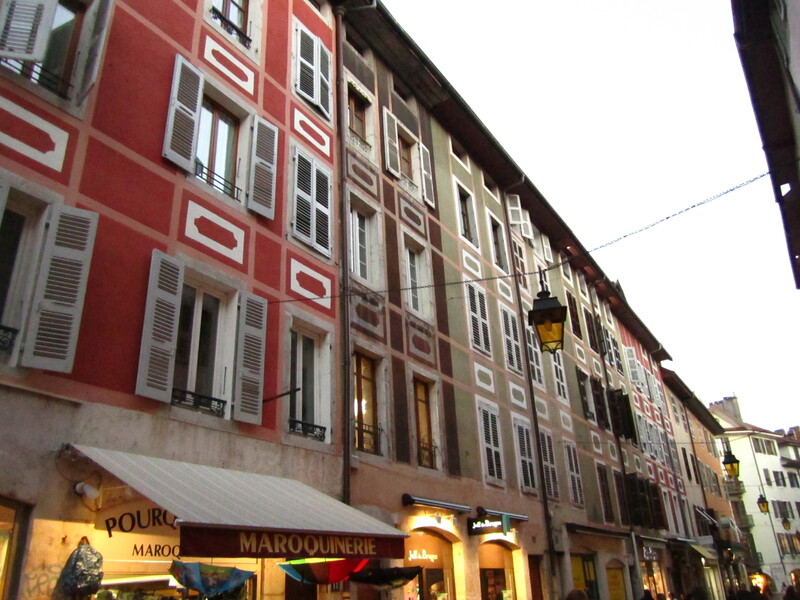 Okay moving on..
Annecy is an old town situated on the breathtaking Lake Annecy right in the middle of the French Alps. To say it’s picturesque doesn’t do it justice. The “Old Town” area was just a few blocks away with narrow streets filled with shops and restaurants galore. 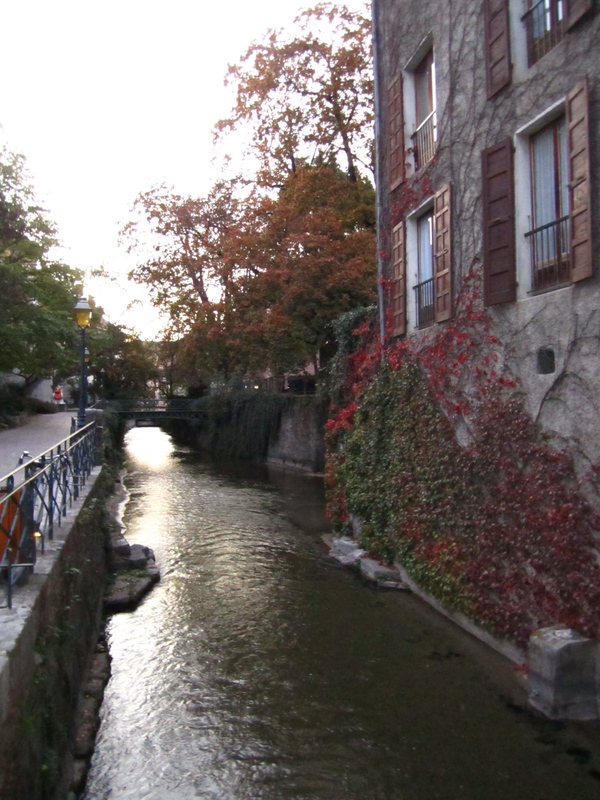 Streams from the lake run through the entire town with old architecture dating back hundreds of years. Our hotel was very nice and new and in a perfect location…right in the middle of the town center with tons of shopping, and just a few blocks from Old Town and the lake. Once we got settled in we headed out to explore and find some dinner. It was getting dark so we only saw a little bit of the town in the daylight but it is was beautiful. 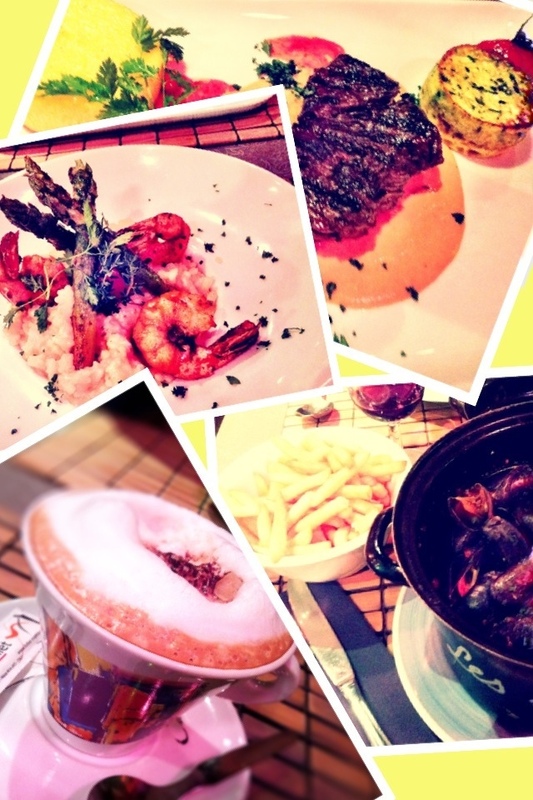 For dinner we found a quaint cafe in Old Town, La Coupole. It was nice and cool outside but the great thing about French sidewalk Cafe’s is most of them have heat lamps to keep you warm. We started with the usual liter of mineral water and a bottle of red. Dinner was fantastic as usual. The mussels were amazing and they’re not light on the portions either. The white wine sauce was full of flavor and the mussels as fresh as they come. The nicest surprise was the giant bowl of french fries that came with the mussels. I love how much the French eat Pommes Frites!! Matt’s steak was juicy and well seasoned…almost like something you’d get in Texas…almost. But I definitely have to say the winning dish was my risotto. The rice was thick and creamy with beautifully marinated shrimp and asparagus on top. Needless to say there was nothing left. 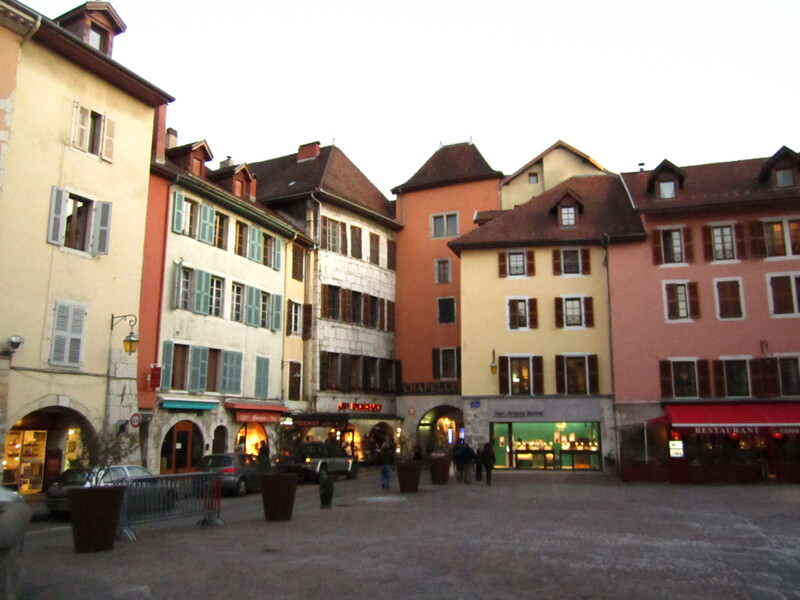 It was a short first day in Annecy and we were exhausted from all the travel. 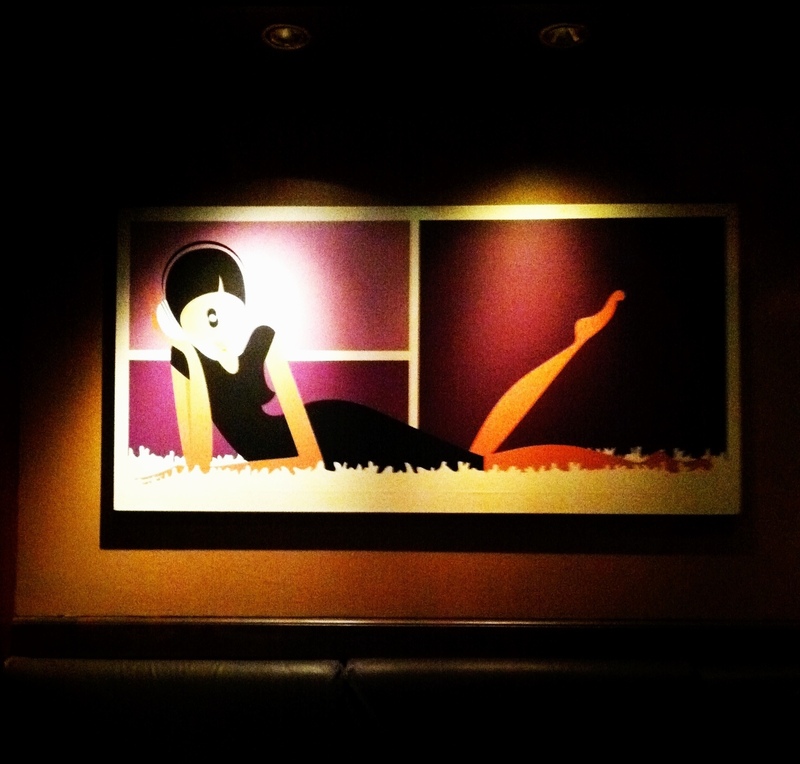 We found a really quaint bar, Le Sensoriel, tucked away on our street to grab a nightcap. There’s nothing like a nice glass of Bourgogne Pinot Noir to cap off another great day. Great update Sarah, and the lead photo has to be my favorite so far, absolutely breathtaking! Have fun, I am out to the wine shoppe to see if I can find a bottle of that Bourgogne Pinot Noir or something comparable…I will keep you posted! Love Love! 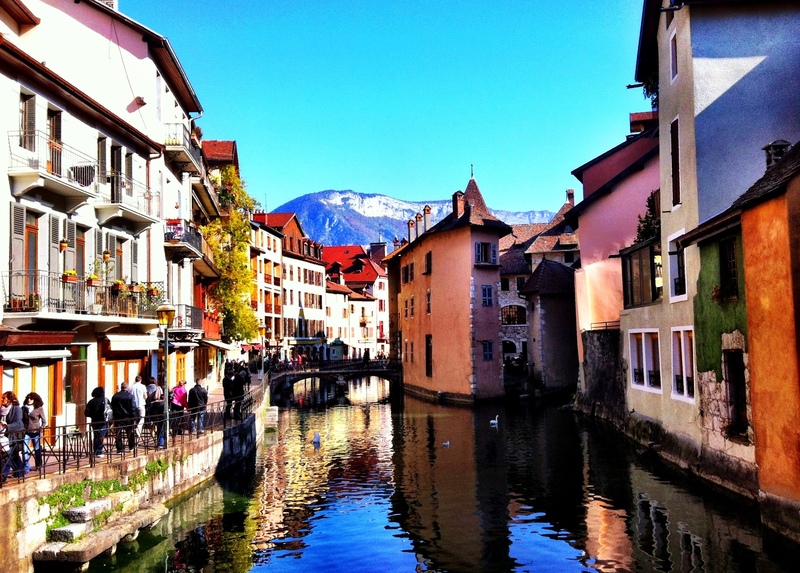 Isn’t Annecy gorgeous? A friend of mine lives there! I am envious of your friend!!! Beautiful place! !